The most common process for printing color photographs, chromogenic color prints, also called c-prints, are prized for their vivid colors and clarity of image. The process was invented in the 1930s and became widely available in the 1940s. Like a gelatin silver print, an older photographic process, the chromogenic color print uses paper coated in several layers of gelatin mixed with silver. Each layer contains a dye coupler that reacts with a different color—cyan, magenta, and yellow. During the development stage, the silver is replaced with dye, and a vibrant color image forms. Originally, c-prints were made from color film negatives. With the advent of digital photography, it became possible to make a c-print from a digital image. To make a digital c-print, lasers or LEDs are used to expose the photographic paper rather than a physical negative. Some artists prefer the quality of c-prints to digital printing methods like inkjet prints. C-prints may be produced using papers of a variety of finishes. Photographer Cindy Sherman has used both matte and glossy papers for her vividly colored prints, which often critique representations of women in art history and mass media. German photographer Thomas Struth also uses the chromogenic color printing process to produce his monumental prints, dealing with subjects like people looking at art in museums, portraits of families, and the hidden machine rooms that keep modern life moving forward. The crisp colors give his prints an uncanny sense of reality. 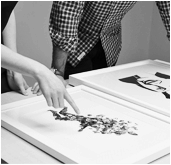 Other artists who create c-prints include Anne Collier, Mickalene Thomas, Daniel Beltra, and Candida Höfer.